Thanks to all of our patrons for voting in Nexzest's poll last year and selecting The Valley Cafe as the 2017 Best Family Restaurant! 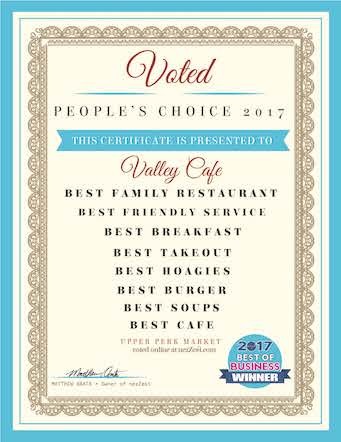 Also, The Valley Cafe won Best Friendly Service, Best Cafe/Bistro, Best Breakfast, Best Hoagies, Best Takeout, Best Burgers, and Best Soups! Thank you for your loyatly and appreciation! We are honored as a staff to be able to serve all of you daily and love the familiar faces we see everyday. We couldn't have fun at our job without all of you! The Valley Cafe offers customized catering for both onsite and offsite events. You can order platters of sandwiches and salads, breakfast items, or choose from a large selection of appetizers, hot dinners, and dessert options. The Valley Cafe is available after 4pm as the perfect venue for catered events and celebrations, including meetings for social groups and businesses. Gift Cards Available in Any Denomination - The Perfect Gift! The Valley Cafe has a birthday club for our patrons... who doesn't enjoy a discounted breakfast or lunch? Celebrate with us on the day of your birthday to receive $5 off your meal. For Veterans, Police, Firefighters, EMT, and Paramedics with Valid I.D. Everyone loves coupons! Click on the coupons below to print.